The African Chicken Genetic Gains (ACGG) Nigeria project staff participated in a three-day workshop jointly organized by the Association of African Universities (AAU) and the Intellectual Property and Technology Transfer Office (IPTTO) of Obafemi Awolowo University (OAU) in Ile Ife, Nigeria. AAU is an international non-governmental organization set up by universities in Africa to promote cooperation among themselves and with the international academic community. It comprises over 320 institutions from across Africa. The Facilitating University-Industry Linkages workshop was held at OAU from 25–28 April 2017. It was aimed at advancing university research through effective linkages with the productive sector. The event featured exhibitions of research outputs by several projects and departments within the university. The ACGG Nigeria team’s exhibition centred on ‘The opportunities for industrial linkages within the smallholder chicken value chain’. Some of these opportunities include hatchery, inputs, micro-financing, processing and markets. 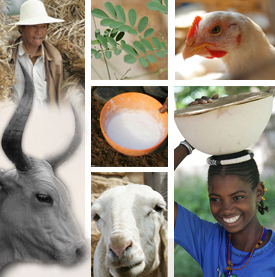 These were presented using a number of channels including a video of smallholder chicken production, infographics displaying the performance of different breeds, a banner showing the integration of science, technology, innovation, and industrial linkages to accomplish development goals; a 10-sided banner showing the five breeds being tested by the project and flyers which highlighted the vision, objectives and scope of ACGG in Nigeria. ACGG-NG also hosted the acting vice chancellor of the Obafemi Awolowo University, Ile-Ife, Prof. Anthony Elujoba, and workshop participants from Ghana, Nigeria and other African countries. Visitors to the ACGG booth included staff and students of OAU and students from secondary schools in Ile-Ife. 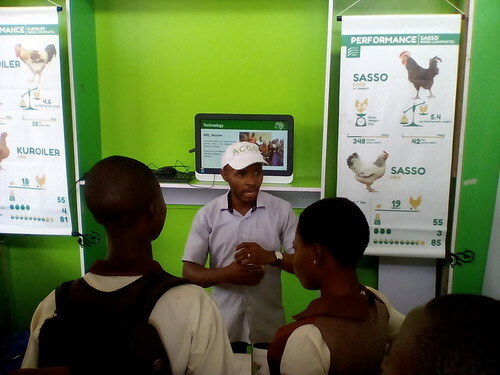 Project staff presented the various opportunities available for private sector involvement in the smallholder chicken value chain as well as the socioeconomic gains available to smallholder chicken farmers. ACGG Nigeria’s participation at the workshop created engagement with stakeholders and actors in the smallholder chicken value chain, which is part of ongoing work of creating public awareness for the project, strengthening the smallholder chicken production sector and attracting private sector partners to sustain long-term benefits of ACGG in Nigeria. Tags: exhibition. Bookmark the permalink.